The EU General Data Protection Regulation (GDPR) comes into effect on 25 May, 2018. GDPR has raised also the standard required of researchers handling personal data. For researchers, it is not only essential to be aware of and to follow the best practices in their field or discipline, but also to identify the appropriate legal basis for data processing. 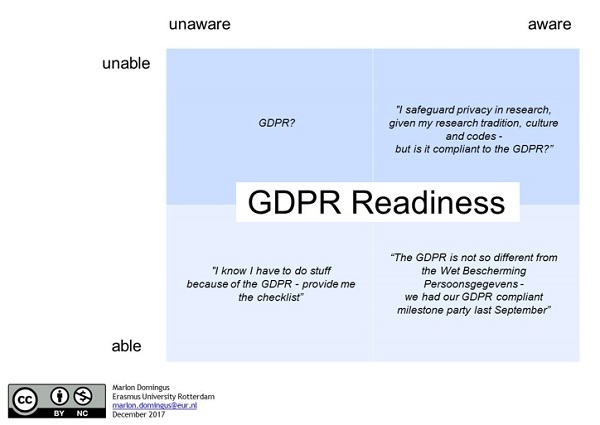 During the recent LIBER webinar on GDPR and implications for researchers, speakers Maria Rehbinder (Senior Legal Counsel at Aalto University and Certified Information Privacy Professional) and Marlon Domingus (Data Protection Officer at Erasmus University Rotterdam) took a look at how GDPR relates to research data management. The focus is on the lawful bases for processing data (in particular Article 6.1e) and protections for ‘academic expression’ as outlined in Article 85 of the GDPR. Researchers will need GDPR compliant data management plans and/or arrangements in order to meet the other data processing and security principles. Researchers will also need to ensure that they supply all information required by Article 13 and Article 14 to research participants, explaining how participants personal data will be used in the project. Open Data Charter Measurement Guide (Open Knowledge International, 2018) analyses the Open Data Charter principles and how they are assessed based on current open government data measurement tools. Governments, civil society, journalists, and researchers may use it to better understand how they can measure open data activities according to the Charter principles. To keep up-to-date with AIMS news, please, Sign up for AIMS news, follow @AIMS_Community on Twitter... And, thanks again for your interest!